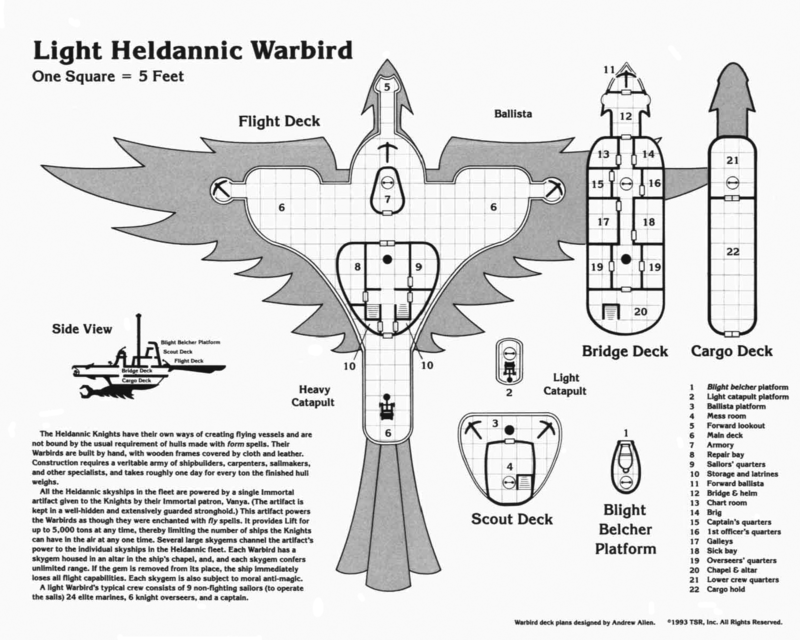 This ship, the Light Heldanic Warbird, fits the best out of all the Mystaran Skyships into a Spelljammer campaign. It has a very evocative appearance, combining both elements of a seagoing vessel and a natural animal. 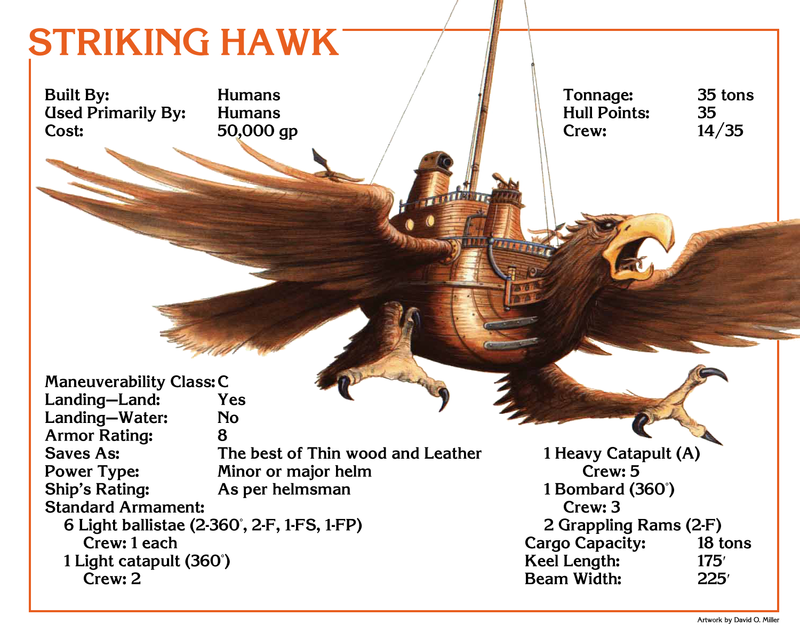 Of all the ships that were in Champions of Mystara, this one (and the Schooner) are the ones I’d most likely add to the list of relatively common ships in wildspace. Description: The Striking Hawk is a recent human design which focuses firepower in a swift and maneuverable package. To achieve the high degree of maneuverability, it trades off the better armor that would come from a metal or thicker wooden hull, using light wooden planking on the main hull and leather hides on the wings. The complicated construction is reflected in the higher cost of the ship, despite the materials. The light ballista in the beak is always fixed, granting it an attack bonus of +2 against targets directly forward. In some configurations, the aft heavy catapult is also fixed into position, gaining the same +2 attack bonus against aft targets. While the weaponry complement of this vessel typically includes a turreted bombard, it is often swapped out for medium catapult if smoke powder is scarce. For a heavier loadout, the two light ballistae on the wings and the light ballista in the beak are sometimes upgraded to medium ballistae (with the two on the wings also getting turrets); this requires a sacrifice of 5 tons of cargo space and extensive time refitting the support structure of the ship. In order to successfully grapple another vessel, the Striking Hawk’s helmsman must successfully hit with both rams. Upon successful hits, each ram deals one Hull Point of damage. Should only one grappling ram score a hit, it still deals damage, but the target vessel can break free by moving out of the hex, although it will suffer an additional hull point of damage as it tears loose. If both rams score a hit, the target vessel is grappled and cannot break free. The Striking Hawk can disengage from the grapple without issue. 1. Bombard (or other medium weapon). The Blight Belcher is essentially a magical once-per-day disintegration weapon with a 300 foot range, for those wishing to create something similar to what the original ship had. Pity that ships from Mystara are not “officially” transferred and included in Spelljammer. Also miss hull enchantments feature, which I like to equip it on ships in my campaign.